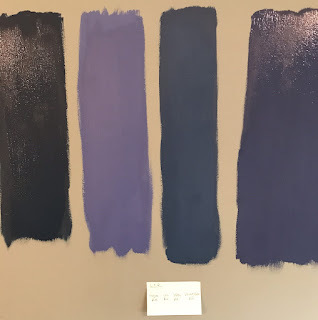 With a sort of naughty-child feeling the sample patches were painted onto the wall. 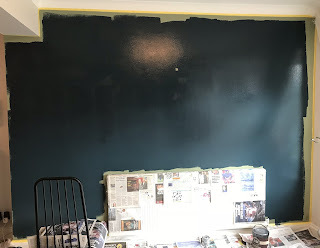 It felt quite rebellious just painting stripes onto the wall, clearly ruining the paint already there. But also quite exciting, taking the first of many design steps in our own home. It was so enjoyable, second coats were painted! As the post-it is a bit illegible, from left to right: Hague Blue, Pitch Blue, Stifkey Blue & Drawing Room Blue. I have to say, it's actually almost just as hard to choose a colour from the test patches! The paints change as they dry, as the light changes and they're influenced by what's next to them, ie. the other samples! We just couldn't tell... so we got more samples! 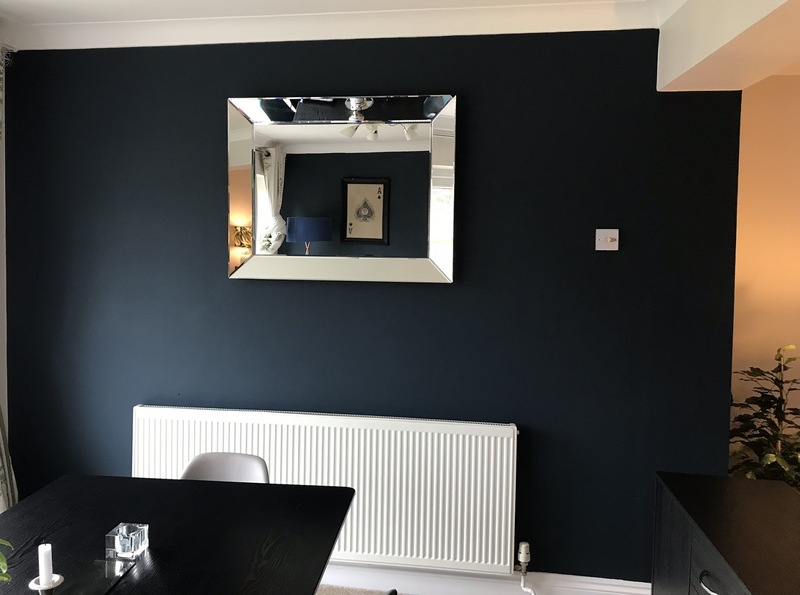 Along with the original four stripes on the left, we had additional Hague Blue and Stifkey stripes as well as Dulux's Venetian Crystal 1 and Venetian Crystal 2 in different places along the wall to try and see how they'd look with differing light options. It was getting a bit crazy. There had been another blue that I was also keen on, but in a ruthless decision, no sample was bought! 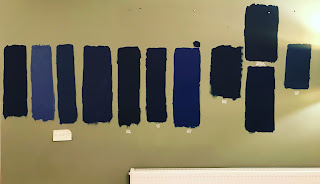 Of course at this point we'd ruled out a couple of the blue's (Pitch Blue, Drawing Room Blue and Venetian Crystal 2). But that still left us with three to choose from. What you probably can't see from the picture is that most of the samples are Hague Blue... so actually deep down we knew what we wanted! Out came the frog tape, the radiators were wrapped in newspaper and carpet protectors were laid. FYI this takes about as long as the actual painting! Please note at this stage the wall behind the radiator hadn't been painted. We used a special roller for this. 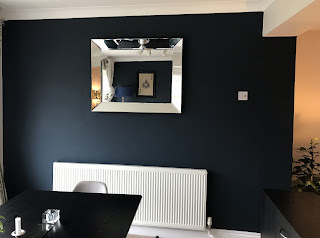 Not just one bought in a shop for behind the radiator, but because that wasn't long enough, an extra long one so that should anyone ever need/want to look behind the rad, the wall will be painted all the way down... I also spent some quality time painting the tiny strip of wall between the radiator and the skirting board! The results are AMAZING. We completely LOVE Hague Blue. This colour has such depth, throughout the day it evolves as the light changes. It's moody and elegant and an utter delight. So if you're in any doubt, be brave and go for the darker colour. 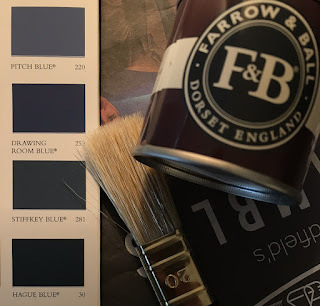 Especially if it's F&B's Hague Blue!